Marcus Law praised the “application” of his Kettering Town players as they bounced back in fine style at Slough Town last night (Tuesday). 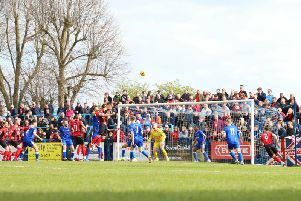 The ever-inconsistent Poppies ensured the disappointment from Saturday’s 3-1 loss at Histon was quickly extinguished as they saw off the Rebels by the same scoreline. All the goals came in the first half with Rene Howe and Spencer Weir-Daley, with his fourth in five games, putting Kettering 2-0 up. Nathan Webb pulled one back for the hosts but Wilson Carvalho’s strike on the stroke of half-time proved decisive as Law’s team saw it out to reach a half-century of points in the Evo-Stik Southern League Premier Division. The Poppies remain in 12th place ahead of this weekend’s home clash with Cirencester Town. And, having vented his frustration after the defeat at Histon, Law was able to make light of the situation following last night’s victory. When asked about his players’ inconsistency, he joked: “They are just a bunch of weirdos! As ever, the only team I really worry about is us. “I think the inconsistency is just a sign of a team that is still in its development stage because on our day we have shown we can beat the best in the division, yet we seem to have struggled against those further down. “We gave some home truths to one or two players before the game and the response was great. “We have brought the likes of Spencer and Wilson in to score goals and Rene is here to lead the line and get the odd one too so to see them all on target was very pleasing. “At 2-0 there was a little error from Ben Stephens on his full debut and they have punished us for it. “But we spoke beforehand about not panicking in such a situation and we didn’t. Wilson was brave in getting across for the third goal and he came up with the goods. “And then I thought our management of the game in the second half was very good. We got the balance right in making sure we didn’t sit too deep. “We were able to get Ben Baker on for a good spell and we brought in Perry Cotton, who gave us that bit of balance we were missing at the weekend.